Adeline Drobinski of New Britain, passed away after a long and courageous battle with the after effects of cancer. She was predeceased by her husband, Zigmund, her parents, Frank and Victoria Trela, and her siblings Irene, Henry, and Edward. 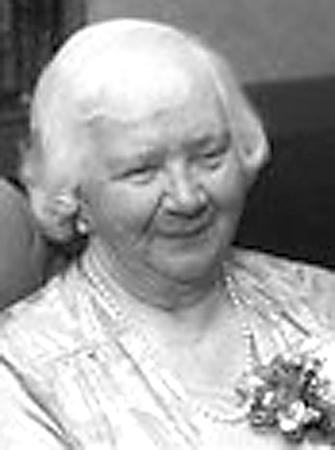 Adeline was an active communicant and member of Holy Cross Roman Catholic Church in New Britain, and as a parishioner was very involved in the Mother’s Club, Ladies Guild, and various parish functions. She had an extremely generous heart and enjoyed giving friends and relatives small gifts whenever she felt like it. And games of chance? Well, she never said no to a day at a casino and really enjoyed her scratch tickets in her later years. Bingo was another of her favorites, but her greatest thrill was playing cards with her family on Sundays after breakfast, with her husband, Zig, her children, and their spouses, and later on with her grandchildren. Adeline and Zig spent most of their retirement together traveling across the country and enjoying life to the max and after her husband’s passing, Adeline would enjoy the warmth of Florida with her son, William, over the winter months. Adeline is survived by her sons, Edward (Sue), Robert (Judy) and William (Katherine); her grandchildren Robert (Hayley), Damien (Geoffrey), Laura (Matthew), Michael, Beth, Kelley and Joshua (Brandy); her great-grandchildren, Xander, Cassandra, Zoey, Shayne and Koda; her beloved sister-in-law, Lorraine Scapellati, and numerous nieces and nephews. Adeline’s family would like to specifically thank her doctor’s, Neil Wasserman, George Melnik, and Mark Pennington for their exceptional care, and attention they gave her over the years as she battled the tortuous results of chemo and radiation treatments. We also want to thank the staff and caregivers of Bel-Air Manor in Newington, who loved Adeline as much as she loved them. They were always courteous, compassionate, personable and fun to interact with in so many ways. We also would like to thank Mrs. Elsie Gadomski who kept mom well-supplied with paperbacks and visits, and Carol DePinto of the Holy Cross Ladies Guild, who visited mom frequently as well. A time of visitation will be held, Friday, Oct. 26, 2018, from 4-7 p.m. at New Britain Memorial Donald D. Sagarino Funeral Home, 444 Farmington Ave., New Britain. Funeral services will begin Saturday, Oct. 27, 2018, 9 a.m. from funeral home, followed by her funeral liturgy at 10 a.m. in Holy Cross Church, 31 Biruta St., New Britain. Burial will follow at St. Mary’s Cemetery located in New Britain. For directions or online messages, please visit www.newbritainsagarino.com . Posted in New Britain Herald, on Wednesday, 24 October 2018 21:02. Updated: Wednesday, 24 October 2018 21:04.